Christian Bumbarra Thompson is renowned for his performative works exploring various notions of identity. In his works he becomes the subject through carefully orchestrated poses, costuming, and settings. 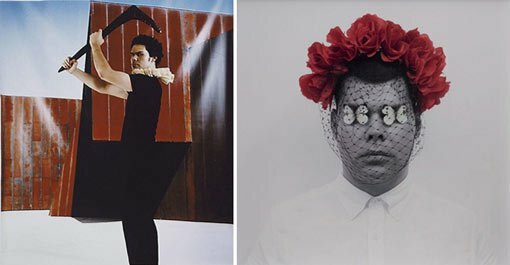 His series Emotional striptease questions the representation of Aboriginal and Torres Strait Islander people by referencing the genre of 19th-century colonial portraiture. Contemporaries and colleagues of Thompson, and Thompson himself, are posed in front of photographic, hyper-real backdrops depicting Melbourne cultural landmarks. The protagonists wear stylised interpretations of colonial attire and hold recreations of traditional objects and weapons from the Melbourne Museum collection. The subjects generate a physical connection to the past by holding objects similar to those their ancestors may have held. This performative act of reclamation defiantly challenges such institutions and the role of Indigenous people within them. Lamenting the flowers is part of a series We bury our own , which was developed during Thompson’s research into the Australian Indigenous photographic archive in the Pitt Rivers Museum at Oxford University, where he is currently completing a doctorate. Thompson examines the effectiveness and possibility of a spiritual repatriation of the archive, in the absence of a physical repatriation. To produce the series, Thompson has described how he meditated over the photographic images, allowing them to enter his subconscious and how through the series he hopes to ‘set something free’, allowing it to embody the past and be intrinsically connected to the present. Examine each of the ten photographs in the series Emotional striptease . Describe the subject of each image, their costume and the object they hold. What feelings or ideas are embodied in each subject’s posture? What common elements can you see across the series? Look carefully at the background of each image. Is it a real setting or a construction? How can you tell? Discuss the relationship between the institutional background, the people and the objects. Describe what you see in Lamenting the flowers . Think about the symbolic qualities of the butterflies, flowers and netting. Is this a portrait or something different? Explain your answer. Why do you think Thompson takes a performative role in his photographs? Find out more about the series We bury our own on the Pitt Rivers Museum website. Why do you think Thompson describes it as part of a process of ‘spiritual repatriation’? Research the history of photographic representations of Indigenous people in Australia. Investigate the work of JW Lindt and Paul Foelsche in particular. Discuss ways that Thompson’s images engage with and critique this history.